Have you ever been swimming in the sea and imagined you saw something large and dark moving just beneath the waves? It was probably the shadow of a fast-moving cloud – yet some primordial fear stirs, unbidden, from a time when much toothier creatures owned the seas. In Maelstrom, you are best off assuming the worst. In this multiplayer ship combat game, it is not your imagination, there really are Murkwater Thrashers lurking just under the surface. 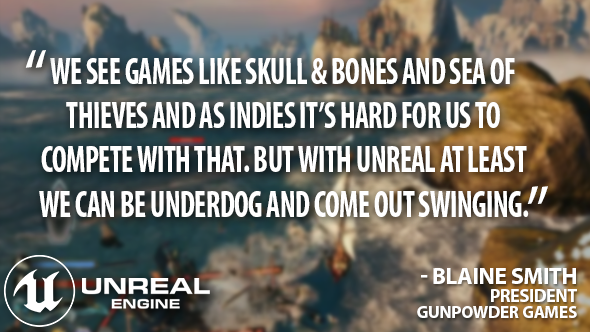 Developers Gunpowder Games have worked long and hard to make the ocean as powerful, convincing, and terrifying as possible. Victory in Maelstrom is all about hoarding gold: seizing treasure chests from sunken frigates, or claiming bounties by filling enemy vessels with holes. Imagine Sid Meier’s Pirates! crashing into the rocks of PlayerUnknown’s Battlegrounds. The Battlegrounds influence rears its head elsewhere, too, in the form of an ever-encroaching map boundary. On Maelstrom’s Caribbean-styled seas, dead waters creep inward, covering the waves with an inky blackness that spells bad news. Drift into the dark and the game flashes up a warning: here be monsters. Five to eight seconds later, the Thrasher rises from below and smashes your ship to bits. 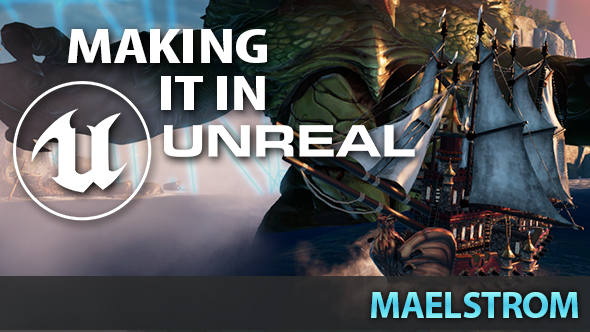 Getting that water looking right – from the rise and fall of the waves, to the translucency that allows you to glimpse the terrors below – has been the biggest technical challenge of Maelstrom’s development. “Our old water shader was absolutely awful,” Smith says. “You just took this material and slapped it on stuff.” That flat, unreflective sea has been transformed, however, by the hiring of a talented graphics programmer. Already, though, there’s a convincing buoyancy to Maelstrom’s ocean. In the past week alone, Gunpowder’s engineer has integrated a new feature that sees loot drift along on sea currents, just as the game’s ships do. “It’s not physics – we kind of cheated,” Smith explains. Gunpowder are keen not to rely too heavily on physics simulation, since Maelstrom is a multiplayer game and bandwidth comes at a premium. Instead, they use a blending trick to track the position of objects in the water. “We have a simple component which says, ‘Well alright, where on the Z [axis] is this thing supposed to be?’. And then you can see it floating up and down,” Smith says. A lot of Gunpowder’s Unreal Dev Grant has been spent on getting their water shader “up to snuff” – but they consider the expense and effort worth it. Triple-A games have visited the ocean before, and they brought their high production values with them. No fewer than eight studios worked on Assassin’s Creed IV: Black Flag to get the shanties recorded and the sea spray just so. Maelstrom, by contrast, has not had the same luxuries in manpower and funding. Throughout development, Gunpowder have made creative, economic decisions. Boarding, for instance, is not a lavishly animated action sequence. Instead, it is visible as a series of Asterix-style swear symbols that appear above the two vying ships – charmingly implied rather than expensively rendered. Their other secret weapon is the Unreal Engine 4 asset store, where any studio can buy art, environments, weapons, or technical solutions made by other developers. By ‘bashing’ Smith means that Gunpowder clean up the assets and make them their own – adjusting photorealistic textures to match the art style of their fantasy ship battler. Every ounce of VFX in the current build of Maelstrom comes from the store. You can read more about Maelstrom on theGunpowder Gamessite.Screenshots are unfinished and pre-alpha.Unreal Engine 4 is now free.